If you're really serious about becoming a great putter this upcoming season, well, I got a great video for you today. We're going to be focusing in one very critical area of the putting stroke, that you probably have really never paid attention to, and that's your eyes. I'm also going to show you a really simple training aid that could save you thousands of dollars on all those putter purchases, and make you save shots on the golf course, round after round. Let's go ahead and get started. Okay, guys. So as I said in the opener, we're going to be focusing in on one of the most important parts of the putting stroke that's probably been overlooked since the time you started playing golf, and the reason for that is, is that we're oftentimes, we're so jaded by so many of the different philosophies that are out there. So many of the different sciences. So many different marketing campaigns. And what I mean there is, is that if you look at putting as a whole, some of the best putters in the world, what do they have in common? Well, not much, really. Okay. You have putters that are different lengths. You got anchored putters that are now going away. You've got big, fat grips. You've got people putting left hand low. You've got people out there using a claw. There's just so many different methods to it, and a lot of these guys are great putters with any method. Well, if you take a step back and you look at this from a big picture perspective and you say, "Okay. Since they don't have any of that stuff in common, and some of these guys are straight back, straight through, and some of these guys are arched putting strokes. What is it that they are so good at doing?" Well, number one. They're good with speed. And number two, they're really good at being able to get the golf ball started on their intended line. Now why is that important to you, at home? Well, because there was actually this study done years ago, and I think they polled right around a 100 golfers and they said, "100 amateur golfers." And they said, "Okay. Get an eight foot putt that's dead straight, and they want you to go ahead and line up, and try to get that ball in the center of the hole." I think it was a shocking number, like six to eight people out of a 100 were only lined up in the hole, and the rest of the people are lined up outside the hole one way or the other. Now why is that a problem? Well, if our eyes are trained to be looking at the center of the whole. In fact, we're lined up left to right, that's going to produce a push or a pull in your stroke, and you're going to start to develop some different flaws. So I always think that it's important to train the eyes, rather than spending money on all these putters. How do we do that? Well, I'm going to show you now. Let's go ahead and take a look at that. Okay, guys. So here is a absolutely phenomenal training device, and it's by SeeMore Golf. It's called the Triangulator. I think I've had this probably now since SeeMore was in existence. Obviously, we know SeeMore is famous for with Zach Johnson, and they're interesting looking putters, and they've got the red dot that helps tell you if the face is closed or open. Lots of good products from that company, but this is a product that's pretty much saved my life on the putting green. The reason being is, is that I used to train my eyes to look in the center of the hole. In fact, I was lined up two inches left, so I had to spend a lot of time with this tool, retraining my eyes and constantly checking to see where they are at, so I could then refine my stroke and get back to all that science that's out there. So this is the first thing that I started doing. Let me show you how this works. Okay. We're going to find about an eight to 10 foot putt here, and you're going to go ahead and take your set up. Let me just put this down. What your goal here is, is this is what we're going to be checking. We're going to go ahead and try to get this ball lined up. My putter face, so it's lined up in the center of the hole. Assuming that this is a dead straight putt. Once I'm ready to rock, okay. I'm going to freeze. Okay. I'm not going to allow the putter to move around. I'm going to come down here, I'm going to put the Triangulator on the front of my putter face here, so it's nice and square. Okay. I'm take it away now. Go ahead and leave it in the ground. We're probably going to see that I'm way off and I'm going to show you guys how poorly my eyes are trained, but this is why we use it. So you can see now, that I'm lined up about two inches, two and a half inches outside the hole on the right side. So now, what I've done is I've trained my eyes, thinking that I was lined up in the center of the hole, and I'm actually lined up right, which now, what am I going to have to do to get this ball started online? Well, I'm going to have pull it. So here's my point. Is that now that I've trained my eyes to look in this direction, what do I have to do? Well, I got to spend a lot of time deprogramming my eyes and making them look in the proper direction. So here's what we want to do. Now we're going to make this adjustment down here to the Triangulator, this is much like a chalk like drill, for you guys at home, too. We're going to align this line up on the triangle, so it's right in the center of the hole. Just double check that. So there you go. So now it's in the center of the hole. So now what I'm going to do is I'm going to go to the front end of the Triangulator. Okay. I have a line on the back of my putter, much like a lot of the putters that are out these days. But, I'm going to use that line, down the same line that the Triangulator's on, and I'm going to get the golf ball just in front of that. My point, or the goal here is, is before I take any putting strokes, is I'm going to look down at the ball, and I'm going to look at the hole five or 10 times. Just to retrain my eyes. Now this looks weird to me, because it now feels like I'm lining up left of my intended target. So you can see the importance of this. This is going to give you a clear indication of where you're actually lined up and how to retrain your eyes, more importantly. So stop spending money on all those fancy gimmicks. All those fancy putters. Whatever it may be. Start investing more time in training your eyes, and you're going to become a great putter this next season. I promise you. To playing your best golf. Now make it a great day. 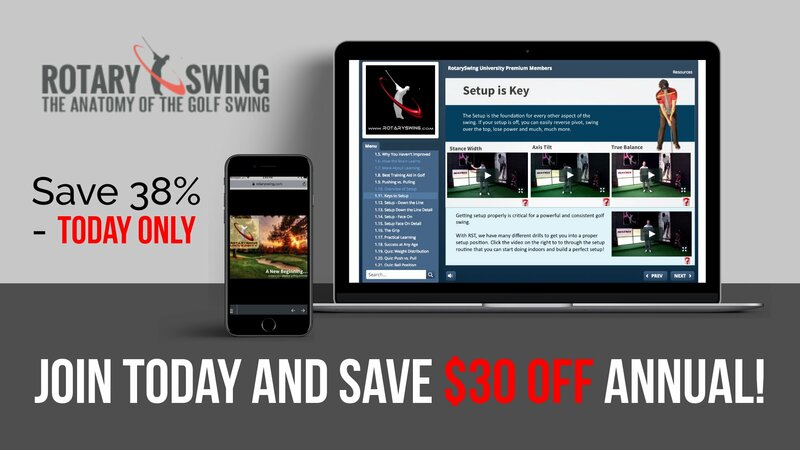 Get Your Free Membership to Finish Watching "Putting Tip | Training Your Eyes" Right Now! Save 38% - Today ONLY! I guarantee your golf swing will improve if you follow my PROVEN 5 Step System! More PGA Tour Pros use the RST fundamentals than every other golf swing method combined! "Just want to let you know the website and Premium Membership has FAR exceeded my expectations. I've been able to make major swing improvements and even the putting advice has been a real saviour. Im very happy I came across the site." The only regret you'll have is that you didn't do it sooner! No Thanks - I don't want improve my swing and shoot lower scores.